Vissers hebben een dolfijn gevangen die kan blozen. Omdat het dier meer geld opleverde als het verkocht zou worden aan een aquarium in plaats van aan de vis industrie, leeft hij nog. Het dier is een albino en heeft een dunne huid. Daardoor is het te zien. Hij bloost na emotionele gebeurtenissen. 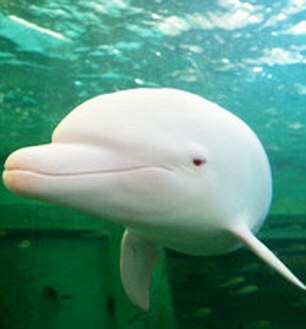 Pic shows: The rare albino dolphin that has no colouration apart from a tendency to turn pink when feeling flushed. 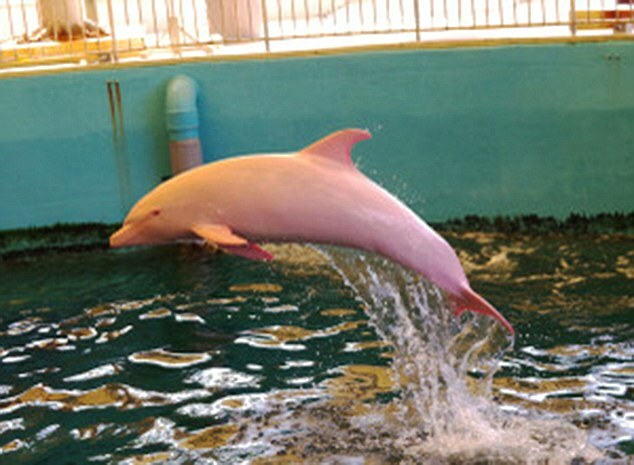 A rare albino dolphin which can go from white to pink when it’s feeling flushed is pulling in the crowds at a water park in Japan. Although bottlenose dolphins are usually grey, this extremely rare albino dolphin that was captured in January last year is an albino and has no colouration  apart from a tendency to turn pink when feeling flushed. It means education pictures show the animal white, and occasionally pink when swimming along regular coloured grey dolphins. Albino mammals are born without melanin, which gives the colour to both eyes and skin, and albino dolphins are extremely rare. In fact this specimen is believed to be only the second one ever put on display in an aquarium after it was purchased from fishermen. And they may well have been doing the animal a favour, as albinos are easy prey out at sea as they lack the colouration to blend in like their grey coloured relatives. Experts said that it was remarkable that the animal had actually lived so long before ending up at the Taiji Whale Museum. In addition, the colouration guaranteed it was worth far more to sell to an aquarium than to eat after it was caught off the coast of Japan during a controversial annual dolphin hunt in Taiji made notorious by the 2009 Oscar-winning documentary “The Cove,” which shows fishermen herding dolphins into a cove either to be captured for aquarium display or killed for meat. Japan’s Wakayama Prefecture, which includes Taiji, reported that 1,218 dolphins and small whales were captured there in 2011, though it didn’t specify how many of those captured were killed. But the rare albino was one that did survive and indeed has become the subject of a detailed study by the Tokyo University of Marine Science and Technology and the Institute of Cetacean Research that published a paper about the albino dolphin in Mammal Study in March 2015.